I had forgotten about vegetable purées as a healthy alternative to potatoes and other starches. Counting calories has made me a more careful cook and I want the most from whatever ingredients I gather together. With St. Patrick’s Day coming up, I knew I wanted something other than the usual roasted vegetables to pair with our corned beef. A celery root purée sounded like a good option. Celery root is a downright ugly-looking vegetable, but it can be coaxed and transformed into creamy soups or silken purées. I opted for the purée and began to think about how to control both the salt and the fat in my recipe. I subbed Meyer lemon juice for all but a pinch of salt and decided to add a small amount of cream and final drizzle of truffle oil, the only fatin the purée. Instead of boiling the celery root in milk, as some recipes suggest, I chose low sodium vegetable stock. TIP: You will need about 2 pounds of celery root to end up with 1 1/2 pounds of topped, peeled and chopped celery root. Using a large saucepan, heat and stock and celery root over high heat until it boils. Reduce heat and cook, covered, until celery root is tender, about 20 minutes. Using a slotted spoon, transfer the celery root to either a processor or blender. Add ½ cup of the stock and process/blend until purée is very smooth. Pour purée into a bowl, season with lemon juice and pepper. Stir and then add the cream. Transfer to a warmed serving dish. Drizzle with truffle oil and serve. True, they’re homely, but what flavor. Like how you were able to reduce the fat, etc. Still looks divine! Thanks, Carol – it was an instant hit here last night. Great reminder of veggie purees! I haven’t ever made celery root, but now I want to, using your recipe! I will definitely try this… probably with cashew cream instead. Yummers! 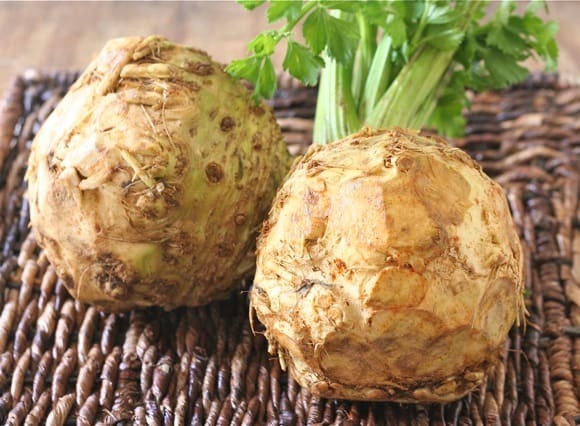 I adore celery root – it’s so underused. This sounds lovely, and a nice light alternative to potatoes. Remember your celery root-parsnip soup? Love that recipe. I think celery root is definitely underused in this country. Love your addition of lemon juice to the puree. I usually like to make a salad out of celery root, but I will puree it next time. Always inspiring…. Celery root is such an underused vegetable, and I really love it. 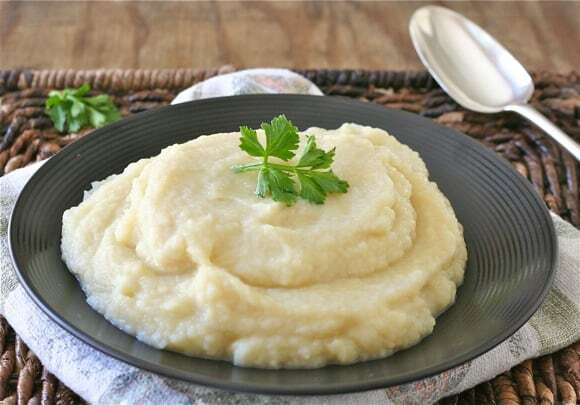 I love this puree- it’s the perfect way to have celery root! I’m going to experiment with other veggies – carrots, parsnips, etc. Thanks, Susan. I’ve never worked with celery root – will have to try this lowcarb alternative to mashed potatoes. Thanks for contributing to the Thanksgiving roundup, Liz! This was my first experiment and I fell in love with the stuff – some folks do a potato-celery root combo. Thanks, Priscilla!